Are you driving to the show tomorrow and have GA tickets? Me too! But here's the situation - as per a response I got from guest services, the parking lot doesn't open until 3:30pm. I was hoping to be on line a little earlier than that, but am unsure of where I can park. The venue is attached to a Marriot but I'm sure the hotel is sold out tomorrow, and I'd imagine they probably don't allow parking for non guests, especially on an event day. There are also some college campuses and parking lots in the vicinity but not sure about access. I know there is great debate about whether being at/near the rail is worth it. I prefer it since I'm on the shorter side, and I have seats to another show so will not be missing out on the screen action. Thoughts? What are you doing? Scout the area early or bite the bullet and show up when the lot opens? Also haven't heard a peep anywhere on the interwebs about anyone starting a GA line...hey I'm not complaining...I'd be happy if it was just a day-of ordeal, as that's all I intend on doing, but curious if you've heard chatter anywhere. Thanks! Hoping for a fun day tomorrow! Hi! Can’t guarantee it, but any time I have been to the Coliseum for shows (since the 70s, as recently as last year), they say the parking lots “open” at 3:30 but that has always meant that the pay booths aren’t manned til then. I have been able to enter before that. Also, The Marriott used to have a sports bar/restaurant and we would eat there, park on the Marriott side and go through a hole in the gates but I don’t know if that still there or if they monitor parking situation so it’s at your own risk. I have plenty of friends that are going to tailgate early so soon as I hear back tomorrow I will post here. hmmm - I did the pay-in-advance for parking....so in the past has there been a gate with a scanner and let yourself in? Thanks for the tip, I was hoping to be there around 1ish, but yes if you know what level of success your friends have please pass it along! I would happily pay to park at the Marriott if that meant getting there early but not sure if it's allowed/frowned upon/or if the hotel just DGAF because I'm sure people will try it anyway ? I haven’t ever seen a scanner to let yourself in, they have guard booths and people before it to direct traffic as there are a couple of entrances. Maybe they upgraded this year but I doubt it. It’s a little confusing around there and there are a lot of parking lots, I highly recommend looking on google maps before just to get an idea. The red arrow/circle is where we used to park at the Marriott and go through the fence, it was easily accessible but I haven’t done it in years. If you get there and the lot is closed, maybe grab a bite at their restaurant (Crop & Kettle, I think) and take a peek at the setup. I just got an email from the venue saying the lots won't open till 4:30. Ridiculous! Total disregard for GA. I've been to a few shows since they re did the building, and the days of going early and free parking went by the way side. They shored up the loose ends to just entering at will. Going to tailgate beforehand anyway. Can't wait to see them on Long Island! Not a problem! 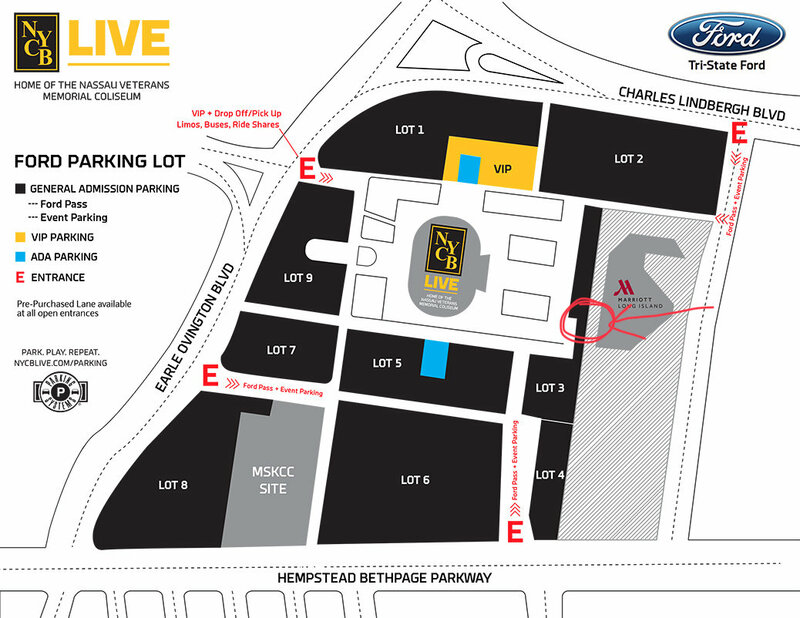 People can start lining up at Gate 17 (GA Floor Entrance) whenever they’d like, but our parking lots will not officially open for U2 until 3:30pm (this has been revised since we last spoke). I’m not sure what you mean by fan-run lines, but we do have barricades set up to start the line in the right direction. We will not be giving out numbered wristbands, we will simply start allowing people in from the front of the line when doors open at 6:30pm on Saturday. We do not have any plans to send out any emails to ticket holders.